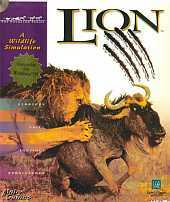 A sequel of sorts to the award-winning Wolf, you are now placed in the same simulation environment, but this time you simulate a....you guessed it, a lion. As in the original you take the role of a lion chosen from a pool of 20 different animals, with varying attributes, in existing prides or handpicked groups made by yourself. You can control a single animal or all members of a pride and you get to play in either a 20-mission mode (such as survive for a day) or a simulation mode, which allows you to do whatever you want. Unlike in Wolf, which takes place in 3 different locales, Lion is played only on the savannas and plains of the Serengeti National Park in Tanzania (tough in four different seasons). Also includes a "Lion Safari", an interactive tour of the leoline life on the Serengeti.